If your air conditioner stops working in Burlington, NC during hot weather, it can be frustrating and miserable. There are various things that can go wrong with an air conditioning system but there are a few common problems that occur most often. 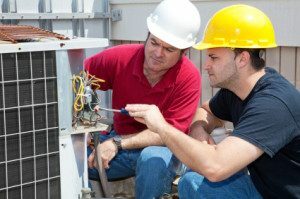 It is best to call a professional repair company to diagnose and repair your AC system in Burlington. An accurate diagnosis and correct repair of the system is crucial to its performance and overall life span, and possibly upholding your warranty. One common problem with air conditioning systems is faulty wiring. If the system is not properly wired it can repeatedly trip the circuit breaker or prevent the system from getting power. Most importantly, faulty wiring is a fire hazard and needs to be addressed and repaired immediately. Professional technicians are trained to check and properly wire air conditioning systems to ensure safety and prevent hazards. Another problem that can occur is a refrigerant leak. The refrigerant is what cools the air, so if it seems the unit is running but the air coming out of the vents isn’t cool, then most likely the refrigerant is low. If the system is low on refrigerant it typically means there is a leak somewhere. A refrigerant leak is also an environmental hazard. A technician can locate and repair the leak and charge the system with the correct amount of refrigerant. You may find that the outside fan has quit running. If this is the case then the hot hair from inside your house is not being transferred outside like it should be. This can cause the compressor to overheat and trip the safety overload. Worst case scenario it can cause permanent damage to the compressor. In most cases this can be repaired by a trained technician. Sometimes the outside unit is simply not running. This can mean there is a lack of power to the unit. It can also be caused by a thermostat issue. It takes a professional to determine the cause and correct the problem. If your filters become dirty or the ductwork becomes blocked, that lack of airflow can cause an internal coil to freeze. Usually a frozen coil is due to lack of air flow but can also be caused by low refrigerant. A professional will be able to find the reason and correct it. The best way to combat against these issues is to obtain a routine maintenance package from a reliable repair company. Alamance Oil Company offers routine maintenance and service plans to the Burlington area. There are various packages available to suit individual needs. Maintenance keeps your system running smoothly and efficiently. A technician will give your system an annual tune-up to make sure the system is working to its full potential. When you keep your system at top performance it extends the life of your system and keeps your energy costs low. We also offer 24 hour emergency service so you can call any time, day or night, if your system fails. Call Alamance Oil Company at 336-226-9371 or visit our website at www.berico.com.